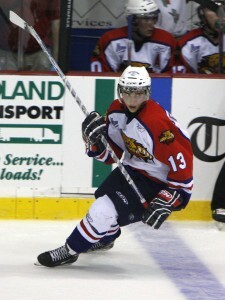 Daniel Pettersson of the white-hot Moncton Wildcats in the Quebec Major Junior Hockey League. “The Moncton Wildcats continue to thrive after they retooled at the trade deadline. “Bryan Cameron and the Barrie Colts continue to dominate Ontario Hockey League's Central Division. “Simply put, the Everett Silvertips haven't lost since 2009. “Jonathan Huberdeau had the biggest game of his junior career Saturday night. “Captain AJ Jenks and Phil McRae were instrumental Saturday as the Plymouth Whalers continue to roll. “The Saskatoon Blades and Derek Hulak made it look easy Saturday night. “Julien Tremblay and Bryce Milson wanted to see the Acadie-Bathurst Titan's slide come to an end. “Justin Shugg helped push the Windsor Spitfires into the post-season Sunday afternoon. The playoff pictures in the Canadian Hockey League really started to take shape last week. In the Ontario Hockey League the Barrie Colts and Windsor Spitfires both clinched spots. As last year’s Memorial Cup champions the Spitfires have been favourites all year, but they’ve been slowed by injuries and suspensions to key players like Adam Henrique and Zack Kassian. Of course, the fact that their top line played for Team Canada in the World Juniors briefly mellowed their offence as well. Those aren’t the only teams in the OHL though. The Ottawa 67’s, Plymouth Whalers, London Knights and Mississauga St. Michael’s Majors have looked pretty strong recently and should play their way into the postseason. The Quebec Major Junior Hockey League is similarly set, with the Saint John Sea Dogs and Moncton Wildcats the early favourites to win the President’s Cup. After Saint John’s historic 22-game win streak, the Sea Dogs have settled into a competitive rhythm. Now it’s Moncton that’s on a tear, winning 12 in a row, trying to play catch up to their consistent Atlantic division rivals. The Central Division is where the action happens in the QMJHL, with the Victoriaville Tigres and Drummondville Voltigeurs side-by-side at the top of the table. Both are solid teams who’ve won six of their last 10 games, but with Drummondville earning two consecutive wins and Victoriaville dropping three straight, the division might sort itself out soon. Like the Moncton Wildcats, the Western Hockey League’s Everett Silvertips have been clawing their way to the top of the standings in 2010. In fact, they haven’t lost since 2009 having strung together 14 consecutive wins. However, they’re still trailing the Vancouver Giants and league-best Tri-City Americans in the West Conference standings. In the East, the Saskatoon Blades, Medicine Hat Tigers and Brandon Wheat Kings have all established themselves as the class of the Conference. All three will have to keep up the pace though, as the Kootenay Ice have gone 8-1-1 in their last 10 and the Calgary Hitmen shutout Tri-City 3-0 on Sunday.